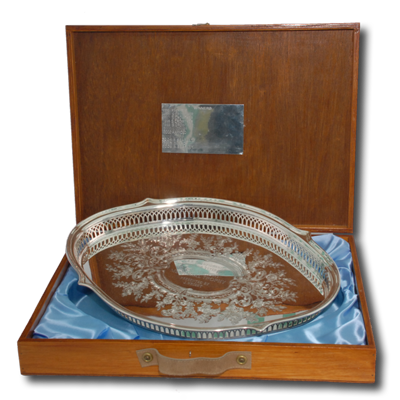 Engraved silver tray with latticework rim in a silk-lined, wooden presentation box. Kent veteran compound archer with the highest score. senior gentlemen 55 years or older, shooting the York round with the compound bow. Donated by Mrs. Jeanette Wright of Medway Archers in memory of her late husband, Tom.